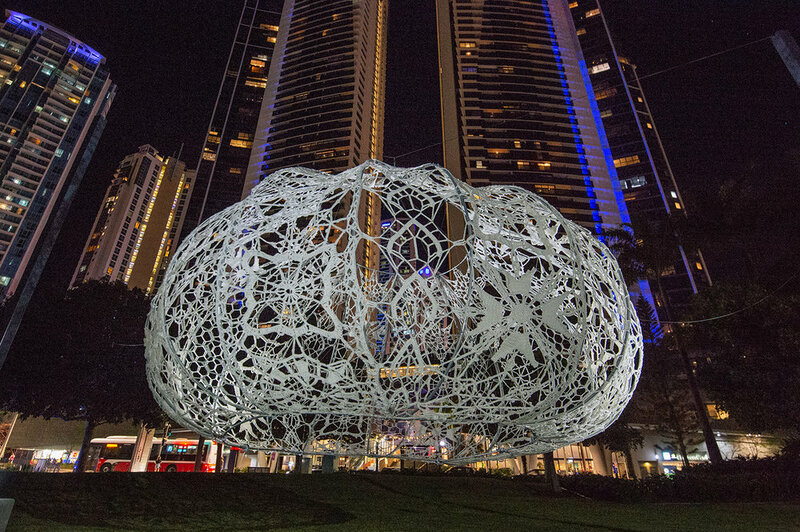 Embodying the spiny sea creatures of the deep, the giant artwork commission by City of Gold Coast is designed by internationally acclaimed artists Choi+Shine Architects and curated by SWELL. International artists Jin Choi and Thomas Shine of Choi+Shine Architects created The Urchins with each motif designed to reflect and represent Australia and the Gold Coast’s land and seascape as well as elements of the Commonwealth. The crochet pattern, designed by Jin Choi, is made up of many small motifs which were then assigned to each crocheter to recreate, using three-millimetre marine-grade rope and the humble crochet hook. It's been impressive to witness each crocheter take on their part of the project forming instant bonds with other like-minded people and sharing the same goal of creating something beautiful together. The encouragement, support and compliments offered to each other have been touching. Not to mention the exchange of tips and tricks, mad dashes and rendezvous to gather more rope and children stepping in as a measure of size! With so many people involved and dedicated to The Urchins, we hope you enjoy the insight into a remarkable artwork and also, the show of strength in creative bonds, friendships and crochet comradeship that has us all hooked! You can experience The Urchins at Appel Park, Surfers Paradise 4 - 15 April, 2018 during Festival 2018, as part of the Gold Coast 2018 Commonwealth Games.